The subtitle of the book is The ultimate guide to understanding, making and eating fine cheese. 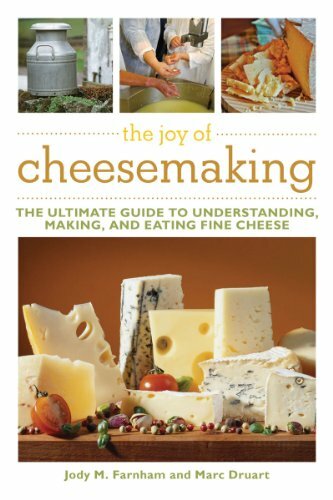 It is definitely the ultimate guide for gourmet, serious cheese artisans. This book has finest of the fine cheeses and procedures for making them. Cheese is classified into 5 different groups; fresh, soft-ripened, semihard, hard and blue depending on how it is processed, its flavors, and characteristics. This book gives you the chemistry behind each one and the ins and outs of how to get the right chemistry. This is definitely a text for a cheese class participant. They break down the milk composition in cow, goat and sheep milk next showing the amounts of water, lactose, proteins etc in each type and looks at the factors that can change the quality of the milk. Without good milk, you won’t have good cheese. The book continues with more chemistry for the cheesemaker in which starter cultures to use for which kind of cheeses you want to make. This book breaks down each and describes them in depth. Proper coagulation and drainage are needed for your cheese as well and the authors use diagrams and photos to teach these. Very detailed in teaching I think this could easily be a book used at some of the cheese making schools in the country. All the processes of cheesemaking are covered thoroughly in the book with pressing the cheese, adding the mold for aging, and even how to cut the cheese properly. We are talking serious cheese making here, not for the very beginner cheese tinkerer.